This volume is a partial translation of the Tibetan text, 'legsbshad-mdzod,' a history of the Bon religion. 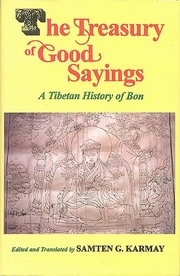 Bon is a pre-Buddhist system of belief in Tibet, which survived many persecutions, and still covered large parts of Tibet till occupation by Communist China in 1959. The book gives a full account of the ancient religion, its origins and developments, its struggles against the later imported Buddhism, and its fight for survival in spite of persecution and even abolition on two occasions. The transliteration of the Tibetan text is followed by two indices of names and a short glossary of rare terms. This is a reprint of the 1972 original. Samten Gyaltsen Karmay is Direteur de Recherche at the Centre National de la Recherche Scientifique, Paris. He is also President of the International Association of Tibetan Studies.